There are a lot of things you must do when making a corset, but for the sew along a waist tape isn't one of them. It's up to you. A non-stretch twill tape can be secured to the inside of the corset to prevent the waist from stretching, some corsets have this, some do not. 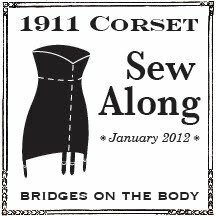 Norah Waugh's Corsets and Crinolines pattern indicates a waist tape, the post Edwardian corset I used to draft the pattern for the Foundations Revealed article did not have a waist tape. If you decide to add one you'll need the twill tape or grosgrain ribbon, pins, and the pattern. Lay the tape on the interior of the corset across the waist. The center back will have the two notch marks, the top one is the waistline, and you can find the center front by placing the pattern piece on the corset. As you lay the tape down pull the fabric of the corset taut, pin the tape, then pull the next section taut. Don't be surprised if when you are done and no longer holding the fabric under tension the tape is loose next to the fabric. When the corset is worn the fabric will be pulled tight against the body and the tape will lie flush with the corset. When the bone casings are sewn in place the stitching will hold the waist stay too. Yea, two jobs with one stitch! Where does the tape end in relation to the facings? Trim it to about a half inch from the center front and center back. I'm slowly catching up and at this step now! I hope to catch up this weekend!! I'm making the Edwardian corset and wondering the pros/cons to the waist tape. I am making this corset for performance so it will be worn a lot. Maybe in this case the waist tape is a good idea? Oh, and what width twill tape do you recommend? Ok, one more... should the twill tape be centered at the waist line or aligned with the top or bottom of the twill tape? Waist tape is a good idea for a corset that will be worn often. I'd definitely put one in. You don't want the corset to stretch over time and cause problems with the rest of the costume. I don't know the brand name of the waist stay tape that can be purchased especially for corsets, but it is sturdier than the standard Wright's twill tape that can be found at most fabric stores. You want a twill tape that isn't think and bulky, petersham ribbon also works well. The tape I used for this corset is just under 3/4 inches wide, and that seems about perfect. I center the tape over the waistline. I hope this helps!